Blindweed is a wonderful herb to farm, it’s used by alchemists and scribes who are leveling through the first 300 levels of their new professions. You won’t be able to sell a lot of it on the auction house but it can go for 5-10 gold or even more. On some realms the price is as low as 50 silver so be careful, always visit your auction house and check prices before you go out farming something. It sells best in stacks of 5, 10 and 20 but like I mentioned it might take awhile to sell. 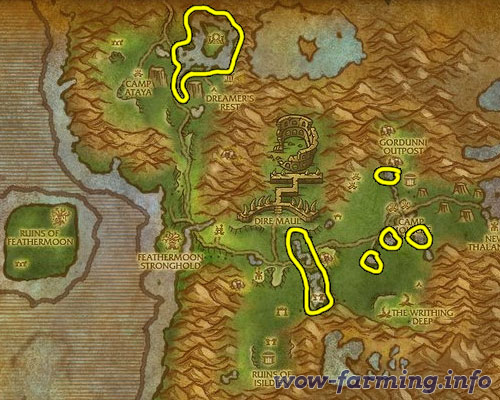 You can farm it as soon as your Herbalism is level 235 and at least level 36. Update: You can make a lot of gold with Blindweed, but if you want to step it up and make thousands of gold you should read my personal favorite guide. 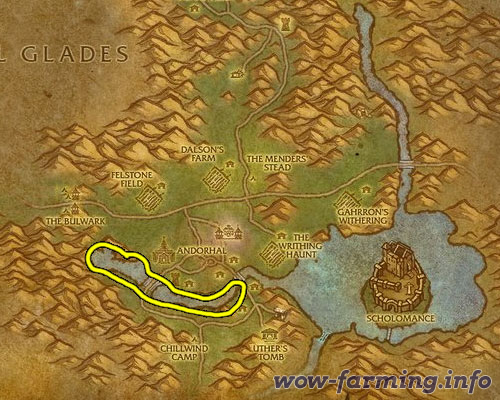 The best place to farm Blindweed is in Feralas. There really isn’t anywhere else that compares. It’s located around the inland lakes and rivers. The lake in the north has a substantial amount of Blindweed but you can also find it right around Camp MoJache if you’re flying in as Horde. hi thank you for your guides … was having a hard time lvling alch . but with your guide i was able to gather 150 blindweed in a matter of minutes. thank you .